Heat oil in a large skillet over medium heat. Cook chopped onions, bell peppers, jalapeños and garlic, stirring, until tender but not browned, 6–8 minutes; season with salt and pepper. 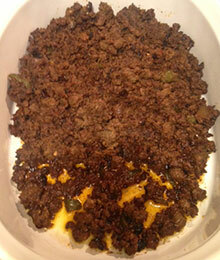 Add meat, breaking up with a spoon, until browned on all sides but not completely cooked through, 6–8 minutes. Add cumin and taco seasoning and cook, stirring, about 1 minute. Season with salt, black and red pepper. Transfer to a serving bowl (like a 2 quart baking dish), cover, place in warm oven until ready to use. Melt coconut oil in a medium saucepan over medium heat. Cook onion, chile, jalapeños, and garlic, stirring, until tender but not browned, 8–10 minutes. Add tomatoes, season with salt, and continue to cook until juices have evaporated, about 6 minutes. Stir in flour and cook until incorporated, about 1 minute. Whisk in milk and continue to cook until mixture comes to a boil and thickens, about 4 minutes. Reduce heat to low, gradually add both cheeses, and cook, stirring constantly, until cheese is completely melted and queso is smooth. If it seems too thick, stir in a little more milk. I added some cayenne pepper and Tabasco to spice it up a bit. Pour hot queso over meat. 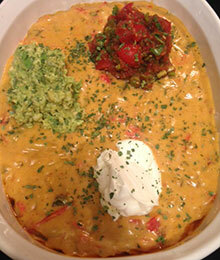 Top with a generous scoop each of pico de gallo, guacamole, and sour cream. Sprinkle with chives and cilantro. Serve hot dip with chips and chopped romaine lettuce.